We had every intention of waking up early and soaking in a little bit more of Florence before driving into the next part of our vacation in Umbria. But you know how it goes…you eat a heavy meal, get drunk off of too many glasses of red wine, grappa, and some sort of military spirit you’ve never even heard of…and then all of a sudden, your 7am wake up call became more like 10am and your plans of making it into Orvieto for lunch on your way to Assisi disappear out of thin air. Not to be the sort that gets down on a shift in the plan, we leisurely ate our breakfast, took one more look at the river, and even did some light shopping by the Ponte Vecchio before hopping in the car to leave Tuscany. The game plan had turned into an “eat lunch wherever we see something good,” sort of thing and we decided that our ambitious Umbrian day-trip would have to do without one piece of the puzzle. As we drove on the autostrada blasting an Italian Top 40s cover of the international Korean hit “Gangnam Style,” we noticed a beautiful body of water in the distance. It was Lake Trasimeno and we had entered Umbria. I had read about Lake Trasimeno while doing research for our trip, so I was familiar with the ancient town of Castiglione del Lago close by. As we hesitated and drove past it, we instead pulled off to get a view of the water and instead stumbled upon Passignano sul Trasimeno; a dainty lakeside town that was quiet but had an assortment of restaurants and small hotels. The vibe here was casual– almost like a lazy beach town. And so we parked the car, surveyed our dining options, and popped into this cute little place called Ristorante Luciano. I won’t lie. The reason why this place won over the others was that the building itself was just so endearing. The decor was vintage-looking and there was a charm about it that drew us in. Luckily, they were still seating late lunch (around 2pm) and were able to accommodate us. Making the most of this impromptu lake trip, we ordered a bottle of sparkling white wine and sat next to a big open window over-looking the water. The service here was attentive and although English was limited, we were able to get by. The boy indulged in a simple pasta dish that was speckled with truffles and local fish, while I dove into a hearty plate of pasta in a sauce made of crushed grape tomatoes served with half a steamed lobster. Surprisingly, our check was modest and the lobster– perfectly done. For dessert we shared their house-made sorbet, a citrus sorbet that is probably one of the best I have ever had; clean, refreshing, and not overly sweet. It’s about 50 degrees and cloudy in Los Angeles right now and I still want a serving of that sorbet in front of me. After our Florentine gelato binge, it was a beautiful change of pace. After lunch we took a stroll along the water and watched old men playing chess next to old bronze statues. There was hardly anyone walking about aside from locals at the end of October, but I’m sure the place swells with vacationers and Italian families in the warmer months. 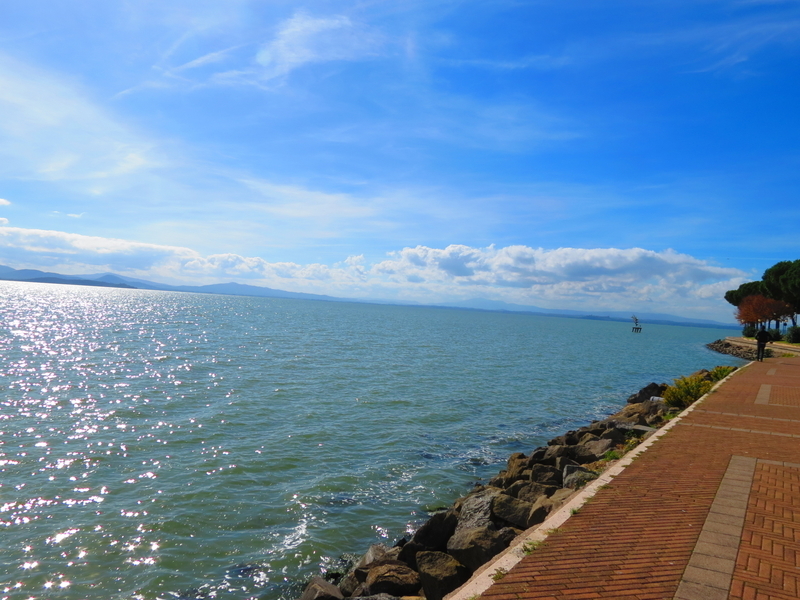 If you get the chance, stop by Lake Trasimeno– even if it’s just a pit stop along the way.